There's no question protein is a daily essential, but everyone's protein needs are different. Learn how to determine how much protein your body requires. Consuming a sufficient amount of protein is essential for proper bodily function. The amino acids released from the breakdown of protein are used by the body as building blocks for enzymes that perform just about every biological function imaginable. This is why one of the first things that happens when there is insufficient protein intake is a reduction in the body's metabolic rate. While especially undesirable for anybody seeking to lose weight, a chronic dietary protein deficiency can cause the body to start breaking down muscle tissue in order to meet metabolic needs. In addition, low protein status can interfere with the body's ability to produce antioxidants like glutathione, which are an essential part of the body's defense against oxidative damage and the aging process. So how much protein do we really need? Often, daily protein requirements are expressed as a percentage of total calories. However, this can be very confusing, especially for those consuming a low-calorie diet as part of a weight loss plan. Using "rule of thumb" percentages (around 10 to 15 percent of total calories) to estimate protein needs can result in a gross underestimation of how much protein is necessary in the diet. A more accurate way to calculate protein needs is based upon body weight and activity level. Since bigger bodies have higher energetic demands, they require more protein. In addition, physical activity increases protein requirements due to a higher metabolic demand. For this reason, people seeking to build muscle, as well as those seeking to lose body fat, should generally be increasing their protein intake when starting an exercise program or ramping up an existing program. For a moderately active person, the average protein requirement is 1 g of protein per kilogram body weight (1 kg = 2.2 lb). As activity levels go up, this increases to about 2 g per kilogram body weight. This means an 80-kg person (about 175 lb) working out three times a week requires around 120 g ( about 4 oz) of protein to meet metabolic demands. There are five categories of excellent protein sources: meat (including seafood and fowl), eggs, dairy, legumes (beans) and nuts/seeds. Each of these sources is roughly equivalent in protein content -- they're each about one quarter protein by weight. That means, in order to get 4 oz of actual protein, a person must eat about 1 lb of protein-containing foods. That's quite a bit of protein! Consider an 80-kg woman who is wanting to lose weight. She decides to start working out three times a week and wants to follow a 1,200-calorie diet in order to maximize healthy weight loss. When taking into consideration the 120 g of protein this woman will require to sustain her metabolism, that comes out to about 40 percent protein by calorie. Now consider an 80-kg man who is wanting to put on some muscle mass. He similarly decides to start working out three times a week, but is going to consume 2,400 calories a day in order to help his body "bulk up." This man also requires 120 g of protein to support his metabolism, but in this case, it's only 20 percent protein by calorie. For people trying to ensure adequate protein intake, supplements offer a convenient way to add extra protein into the diet without adding any unwanted calories. In addition, protein supplements are often formulated to be more easily absorbed from the digestive tract than when found in whole foods. The most popular protein supplement is whey protein. Whey is the high-quality fraction of milk protein and the less desirable fraction is called casein. In addition to providing a full spectrum of amino acid building blocks, whey protein has also been shown to increase the production of glutathione in the body. For those seeking to avoid dairy (for allergies or other reasons) egg white protein is also available in supplement form. There are also several plant-based sources for protein supplements. The most common are soy, brown rice and pea protein. Each of these has their own advantages and drawbacks, however, pea protein appears to be the most favored among health and fitness enthusiasts at present. Can we get too much protein? It's certainly possible to get too much protein in the diet, although an otherwise healthy person would need to work pretty hard at it. One of the byproducts of protein metabolism is nitrogen, which needs to be processed and eliminated by the body. Shortages of B vitamins can interfere with nitrogen processing and those with impaired kidney function need to be particularly careful about protein intake. In addition, those with low stomach acid or digestive enzyme production can have problems breaking down protein in the gut. Undigested protein passing into the large intestine can be fermented by gut bacteria, producing a number of compounds detrimental to health. Generally speaking, getting a bit too much protein is highly preferable to a bit too little, so it's better to overshoot the goal, because excess protein can be converted to carbohydrates or fat and burned for energy, while the reverse pathways aren't expressed in the body. Finally, remember is every body is different, and general guidelines may not apply in a specific situation. When making adjustments to dietary intakes as part of a fitness or weight loss program, it's imperative to have a specific set of goals (such as body fat percentage or muscle circumference) that can be used to validate the dietary changes are creating the desired result. When in doubt, seek out a nutrition professional for more detailed evaluation of individual needs. This whey protein powder does more for your body. With 17.5 g of protein per serving, you have the fuel you need while added BioFerrin supports your body's defenses. Available in three flavors: berry, chocolate and natural. 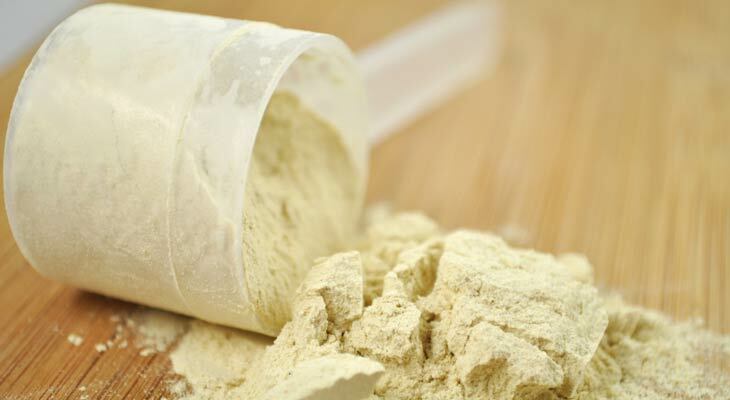 No GMOs can be found in this pea protein powder, which provides 28 g of protein per serving. Perfect for vegans and vegetarians, just mix it with water, juice or non-dairy milk and you're good to go!